It is fall! Time for all things Chai. That usually means a lot of temptation for me. Not anymore!!! Now that I have replaced the stuff I used to put in my chai tea with Shakeology, I am staying fit and healthy and get a treat too! Why? Because Shakeology can help you loose weight, reduce cravings, increase energy and stamina, promote health digestion and regularity. By replacing Shakeology with one meal along with regular exercising and eating 5-6 small meals a day it can help lower cholesterol by 30% to 70% and help reduce bad cholesterol by an average 38%. the shakes can reduce cardiovascular risk by 24% on average, lowers oxidant damage caused by free radicals on the average of 45%, which can also help decrease the risk for developing heart disease, dementia, and arthritis. There are over 30 superfoods in Shakeology, but I am going to educate you today on two of my favorites: CHLORELLA and SPIRULINA - Did you know these superfoods can actually reverse cancers? Both of these super-foods have been clinically shown to demonstrate stunning preventive and curative properties when it comes to all sorts of cancers. They both rebuild nerve and damage in the brain and nervous system. That’s why they have been used for recovery of patients with Alzheimer’s and Parkinson’s disease. I would like to help you get the proper nutrition in your body. Eliminate foreign chemicals and non-food items you have been putting in your body, and fill it with superfoods. Contact me today to get started on your new happy healthy fit life. 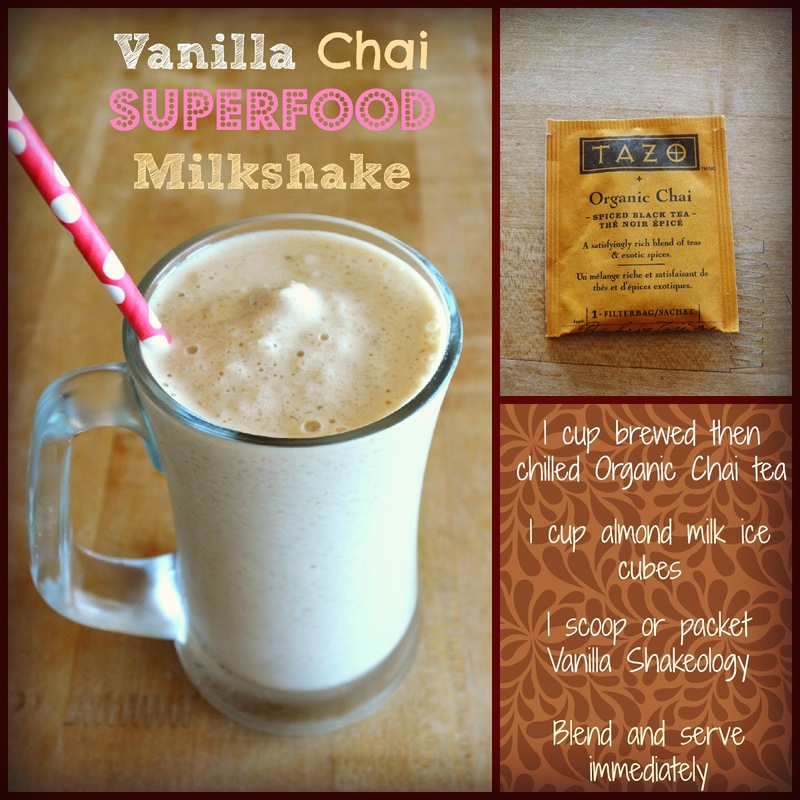 Recipe for the Chai shake is on the image. Just blend and serve! Enjoy!